Is it a Reason or an Excuse? When I was in the navy, my work usually took me below the waterline onboard ship. In other words, I worked in the bottom of the ship and any massive casualty could result in rapid flooding where I worked and I would drown. We constantly trained on how to fight fires, massive leaks, battle damage…etc. One of our main defenses were certain doors that were to always remain latched. They were designed to be water tight barriers in case of flooding. 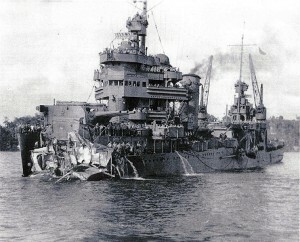 This picture is the USS New Orleans after the front had been literally sheared completely off by torpedoes. Yet the ship still floated and actually was still functional enough and many people survived. Why? Yes, those watertight doors. People who forgot and left those doors open (some ships did sink because of that) could be severely reprimanded. There was always an excuse. Someone was coming right back or something else. To them it was a good reason. But there was no good reason when 50,000 tons and hundreds of lives were at stake. Only excuses. But what is the difference between a reason and excuse? Boiled down to it's basics, a reason acknowledges responsibility, an excuse tries to avoid it. In other words, if I say I will teach a class on Sunday morning, but have problems showing up on time, there are consequences. If I acknowledge the problem and the reason, such as “I am feeling really weak right now,” and then address the problem by an action, such as getting up earlier, or enlisting help to teach the class if I need to, then it is not an excuse. I care and I am going to fix it, however I can. But, if I just say something like, “Oh, it’s just how I am on Sunday mornings,” or, “Oh, it’s just my disability flaring up” and never make an effort to fix the problem because it’s no big deal or it’s not my fault then I am using an excuse. The reason may be understandable. But the truth is, I could fix the problem, it's just not a priority. There are consequences for that. I may lose class members. I may lose any reputation that I have had in the church. People may get the impression that I don’t care about them very much, because I don’t care about whether they have a teacher or not. There are plenty of examples of this in the Bible. 14 Then the anger of the LORD was kindled against Moses and he said, “Is there not Aaron, your brother, the Levite? I know that he can speak well. Behold, he is coming out to meet you, and when he sees you, he will be glad in his heart. Now we all have our character flaws and there may be justifiable reasons why we have difficulties. But, if I want true Godly growth, I have to acknowledge those times, when I am tempted to use an excuse to not take responsibility and then take it to God and fix them as His will sees fit, not mine. But people depend on you too! They need you to not make excuses. They need to see you take problems to God and continually grow through them. God will do this. He wants to do this. He wants to make you like a ship; unsinkable…unstoppable. Do you have something in your way that needs work. Make it a priority and fix it. He will be glorified when you take reasons for excuses and make them reasons for growth.